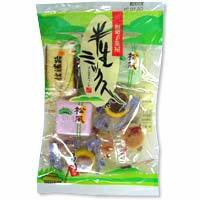 Monaka (Japanese sweets), chestnut cake, and sponge cake- all in one package. Even with the very same red bean jam, the taste and the texture differ between the monaka and chestnut cake. Savor these luscious treats with the full, rich taste of red bean jam.